Posted September 19, 2011 by Josette Farrell in News. 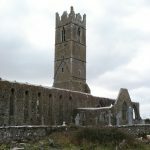 The height of a wall being constructed in Claregalway by the Office of Public Works is causing some consternation locally – it is claimed that it is blocking the view of the old Franciscan Abbey. And it has been learned that a letter has been set to the OPW from a local TD asking if the wall can be lowered as its height was causing a lot of disquiet locally. The new wall is being built following the flood alleviation measures that took place recently at the bridge in Claregalway but a number of local people are not best pleased at its height. Views of the nearby Abbey are blocked out by the wall on both sides of the bridge and now attempts are being made to get the OPW to lower the wall to a more acceptable level. Local TD Noel Grealish has now written to the Office of Public Works after he received several representations over the height of the wall. Deputy Grealish said that the wall obscured the view of the Abbey and this was not acceptable to the people of Claregalway who now wanted it lowered. The monastery in Claregalway was commissioned in about 1252 by John de Cogan, a Norman knight who took possession of the area following the Norman conquest of Connacht. The Franciscan community at the Abbey lived under the patronage of the de Cogan clan until 1327, when John Magnus de Cogan gave them the building and surrounding lands. The community flourished until the mid-16th century, when the English Reformation disrupted the Catholic establishment in Ireland. 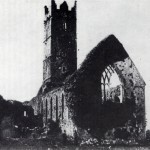 From that time on, the monks of Claregalway struggled to keep the abbey viable against political and economic forces. 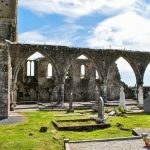 On July 11, 1538, forces under the command of Lord Leonard Gray ransacked and looted the abbey while on march to Galway. In 1570, Queen Elizabeth I granted possession of the monastery to Sir Richard de Burgo. In 1589, the monastery buildings were turned into a barracks under the administration of the English provincial governor, Sir Richard Bingham. During the reign of King James, the property was given to the Earl of Clanrickarde. By 1641, the Franciscans had reoccupied the abbey, but the building was in poor repair and the community lacked the ability to renovate it. Church records indicate that the community numbered about 220 religious in 1766, but this number had declined to about 150 by 1782. It still is a popular visitor attraction in the area and that is why the local community want it kept in full view. Deputy Grealish said that he now wanted the OPW to lower the wall immediately before any further works took place. He described the Abbey as being of huge historical importance for the area and should not be “hidden away”.